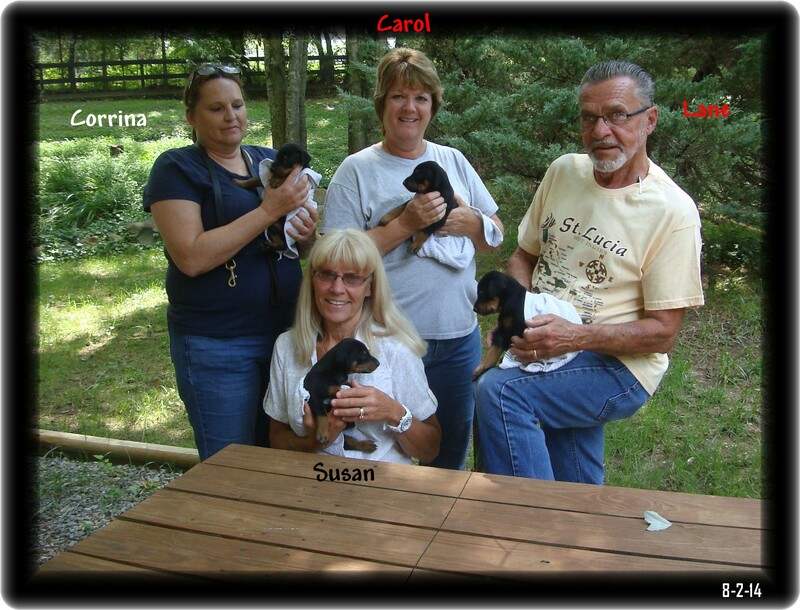 Meet many of yesterday and today's winners - These Winners will Create the future Doberman Pinscher Pups of the Tomorrow.. This is a "WOW" Impressive feat for any trainer to achieve! Now meet some more of the stars of the American Performance Ring. Look out world - Here we come! Sophie...formally Hoytts Treasure Lies Within CGC BN CDX Our Baby Sophie was one of five pups presented to their owners at DobeFest 2014, All medical services had been competed, four went to established clients and just good timing that the youngsters were ready for their grand showing at DF. 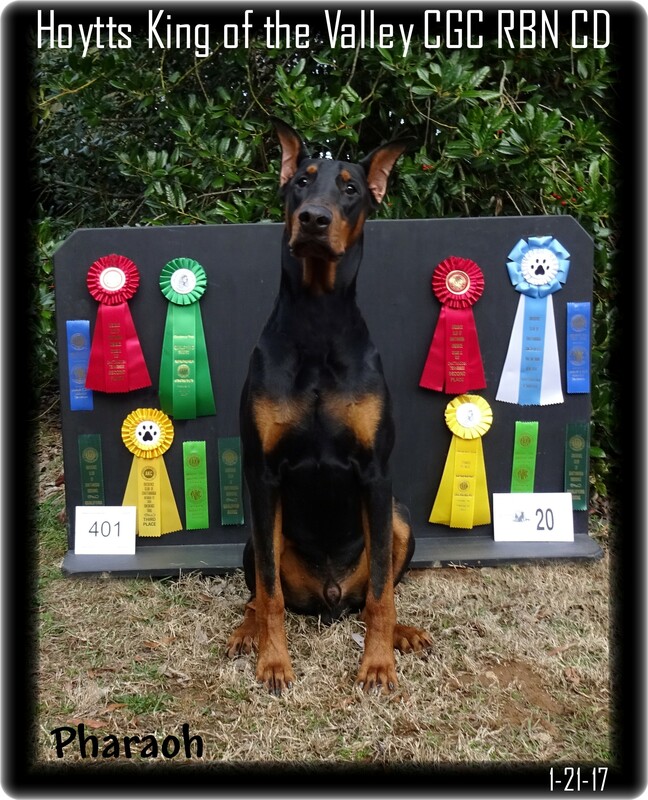 If you made it to Harrisburg Pa to the National Obedience Invitational on 3-29/30-2014 you saw Feebers formally Hoytts Hidden Treasure UDX4 OMS GO GM in action. 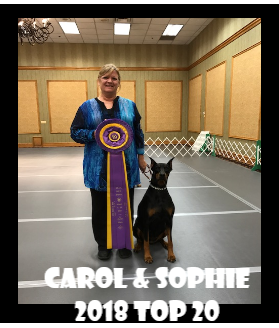 - Feebers trained and handled by her owner Carol Stephens had also made the Doberman Pincher Club of America Top20 four years running. 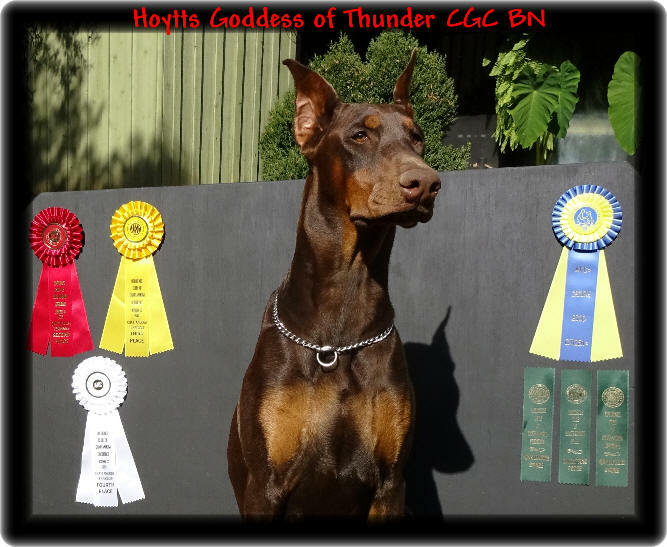 In memory of this great companion and competitor a new star immerged named Sophie today formally Hoytts Treasure Lies Within CGC BN CDX and before a year of age had made the DPCA T20 monthly standing and continues to make the list as she adds points toward the day she goes for the Gold. NOTE: Ross formally Hoytts Son of a Gun CGC RN RE CD TDI introduced in Planned Parenthood helped bring us a new generation of Hoytts and today just enjoys life with his blue eyed, blue girl Ivy formally Hoytt Love Potion No. 9. Those who have welcomed Hoytt Dobes into their family circle hoping to developed a second platform - a performance partnership in the American Kennel Club or United Kennel Club* sponsored obedience trials usually found their free week-ends were not as easily arranged as hoped but Rally, Agility as well as some of the rungs up the ladder of formal competition while time limited did spend some of their earlier years in competition. ** But then we have those who have the time to learn the complex exercises and have the Hoytt Dobe who can absorb every step as it's human partners knowledge grows. 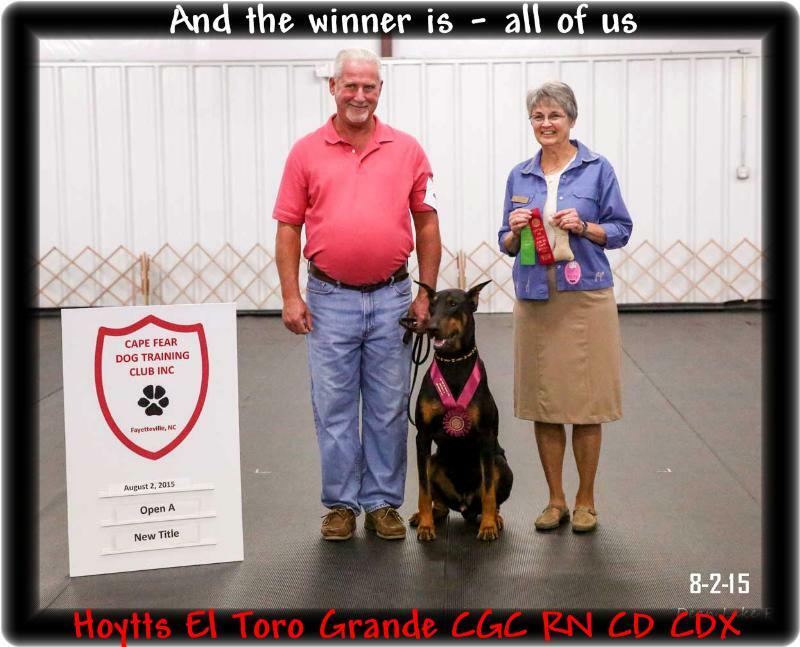 So while we have hundreds of clients who's Hoytt Dobes over the years have gained their place in the history record of our breed with CGC, Rally or well up the ladder including Service and Therapy certifications, some teams just keep climbing. One of our earliest obedience team success's saw Don Hahn with the blessing of Mrs. Hahn of course ( of the Colorado Hahns ) and their Dobe Fawn formally Hahn's Fawn Von Hoytt CDX saw their 'companion' Dobe loved for who she was, step into 1976 DPCA National ring with 'dad' and walk out with High in Trial. It was now time to give her a few more kisses and head home to the her true calling - a wonderful loving companion of sticking beauty. Today almost five decades later the Hahn's are the proud 'parents' of Mica formally Hoytts Classy Lady CGC and Nico formally Hahns Nickel Von Hoytt CGC - the only competition these Dobes two are involved in today is who gets to mom or dad first for attention or when it's time to head out for their trail walks. You will find photos of 'the family' taken at our 2012 DobeFest and in the archives of The Owners Galley. 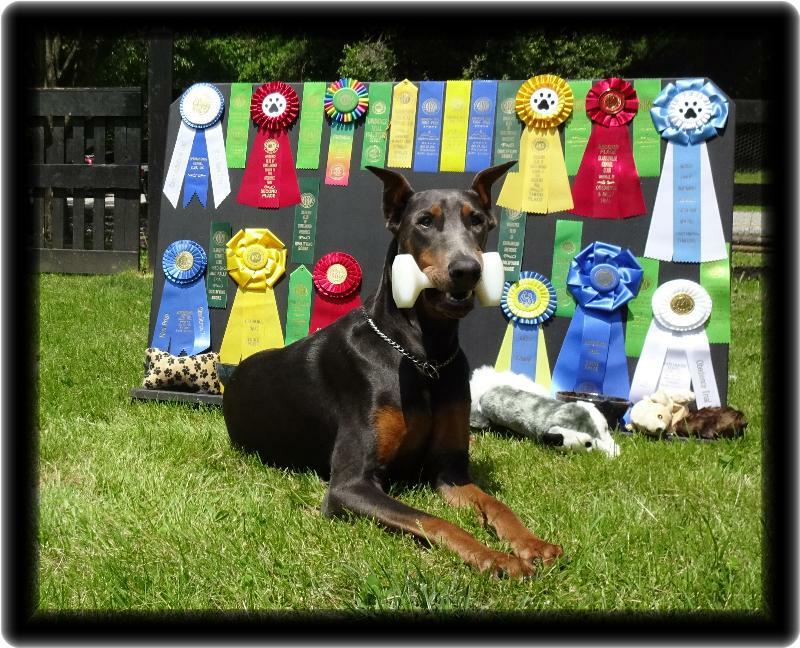 Ring training to actual competition has other bonuses, ways of refining control in the world of humans but then folks like those who will be featured in this section that found the obedience ring to be a great interactive partnership give me bragging rights no other Dobe breeder has enjoyed. ...and just as I was about to move into this site Hoytt's Meant To Be ll CGC CDX RAE USAR went Rally Trial High Combined on 1-19-13. I wanted to write to tell you what a great year 2012 has been for me and my special teammate and best friend, Phoebe. We began the year of 2012 with two goals - to complete her UDX (Utility Dog Excellent) title and to also earn her OM1 (Obedience Master 1) title. Well, my girl didn't disappoint me. Not only did she earn her UDX title, but she also earned 8 of the required 10 legs towards her UDX2 title. Along with that, she completed her OM1 title, earned some OTCH points, along with 1 of the required wins towards that prestigious OTCH title. She also finished in the DPCA Top 20 for the 2nd year in a row! I think the highlight of the year for me was at the DPCA Nationals. On the first day of showing, Phoebe placed 2nd in the Open B class, and 3rd in the Utility B class. This completed her UDX title - what a place to complete that oh-so-difficult title! When I thought that was going to be the highlight of the year, Phoebe showed me that it could get even better. On the second day, she tied for 1st in the Open B class (but lost the run-off), and then she showed in the Utility B class and won! That gave her not only her 1st UDX2 leg, but also the High Combined award. 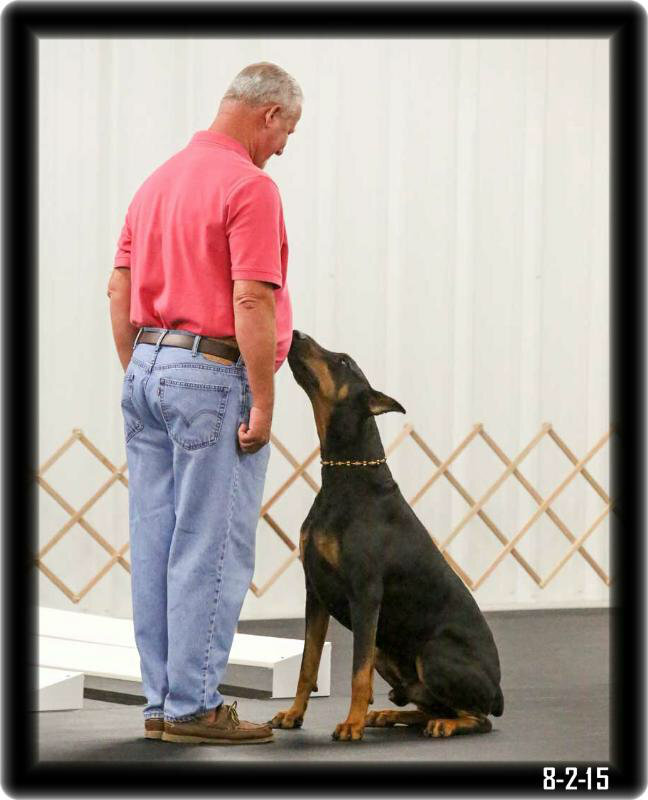 It was extremely exciting to earn such a difficult award, as it is the combination of the scores of both the Open B and Utility B classes, which are the most difficult obedience classes the AKC offers. This was also the 2nd time she earned this award in 2012. 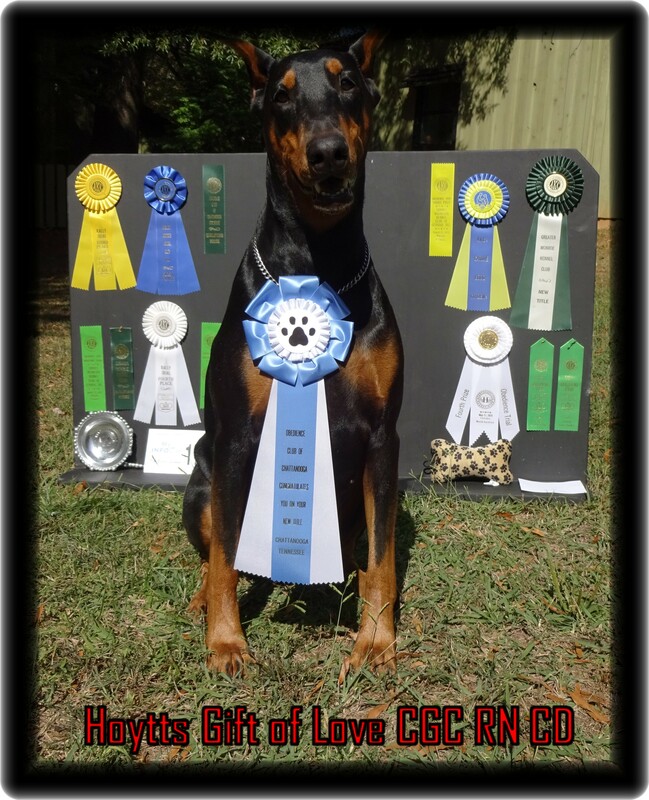 What made this one so special was that my girl won it at the DPCA Nationals, competing against her own breed, which showed that she was the best Doberman of the day in the toughest classes! We finished the year by qualifying in the Open B and Utility B classes 15 out of 16 times in the ring after the Nationals. The more Phoebe shows, the better she gets. She loves travelling, and enjoys going in the ring to 'do her job'. She is very serious about her work, and is so steady and consistent in the ring, that every trip is pure joy for both me and my girl. After such a busy and successful show season, I decided to take her on a 'fun' trip - she got to go to Florida for the first time and do nothing but play. She really enjoyed her trip, but after returning home she was more than anxious to get back to 'her job'. She actually gets upset if I work with the other dogs and give her the night off. She doesn't want time off, she wants to work. I feel that her reason is because she knows it makes me happy. The Hoytt Dobes are so tuned into their people, they will do anything to please us. Phoebe knows that working with her and spending one-on-one time with her is what I enjoy most. In return, I do everything I can to cater to her and make her life pure joy. For me and Phoebe, it's an even exchange, and that's why we are a true team. We work together for each other, not just with each other. I want to say thank you for the life-long work and dedication you've put into your lines. The Hoytt Dobes are beyond dogs, they are so special that words can't describe the experience of sharing our lives with them. Your ability to match each Dobe to it's perfect household and family is uncanny. I live with 3 of your Dobes, and all though each are as individual as we are, they are all a perfect fit to our home and to each other. So once more, thank you for creating such outstanding companions and teammates, and thank you for choosing Phoebe as my best friend and perfect teammate! 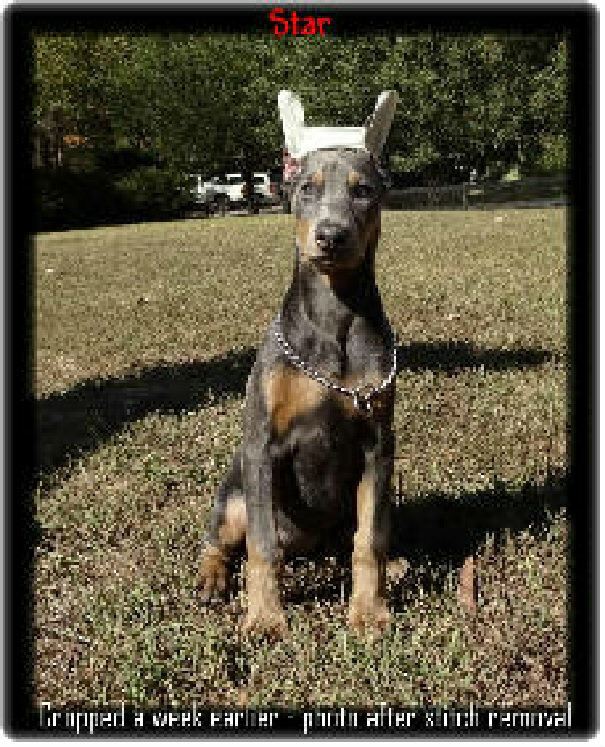 Phoebe "Hoytts Hidden Treasure UDX OM1 GNU GO RE"
MOMENTS FROM THE PAST...6-1-12...We are always behind in our brags, Phoebe along with her housemate Sonny and about 300 miles N.W from these two, a pretty thing called Hope resides - all three made the Doberman Pincher Club of America Obedience Top 20 for 2012. Phoebe and Sonny have racked up so many wins since "Phoebe had another great week-end" that I will be moving these guys to their own page. A page just for the 'kids' that worked so hard to stand so tall in the world they tackled in their spare time - Competitive Obedience for in the end they are still 23 hours 59 minutes* a day just part of the family. Here's an unknown fact. 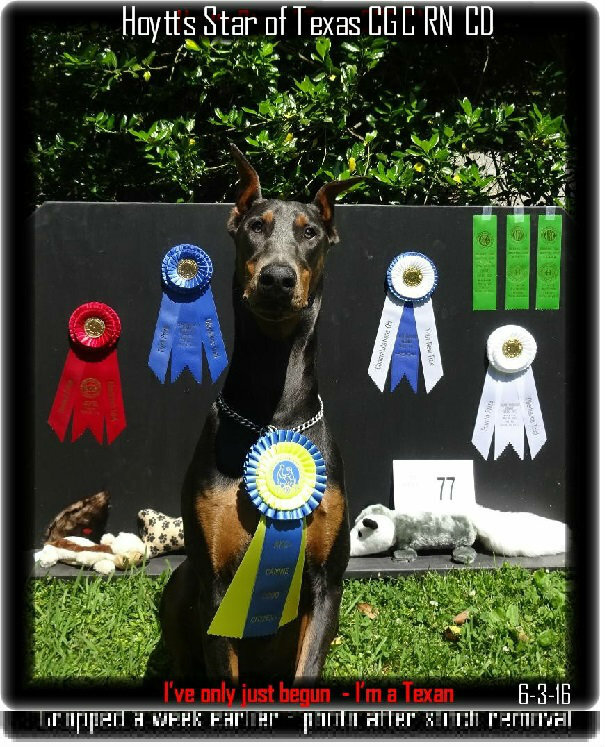 You don't apply for the Top20, you automatically begin heading to this exclusive list simply by being the best of all Dobermans in America showing in AKC sanctioned obedience shows - imagine that just by doing better then the thousands of other Dobes competing in CD, CDX and Utility you get a call from the D.P.C.A...congratulations you made the "LIST". Phoebe had another GREAT weekend. On Saturday, she earned her first leg towards her UDX title with the very respectable scores of 196 in the Open B, and a 195 in the Utility B class, out of a possible 200 score. Earning that first leg was very exciting to me, as both classes that she's required to qualify in are the most difficult and the most critiqued by the judges...any move that's less than perfect is counted against the dog's score. 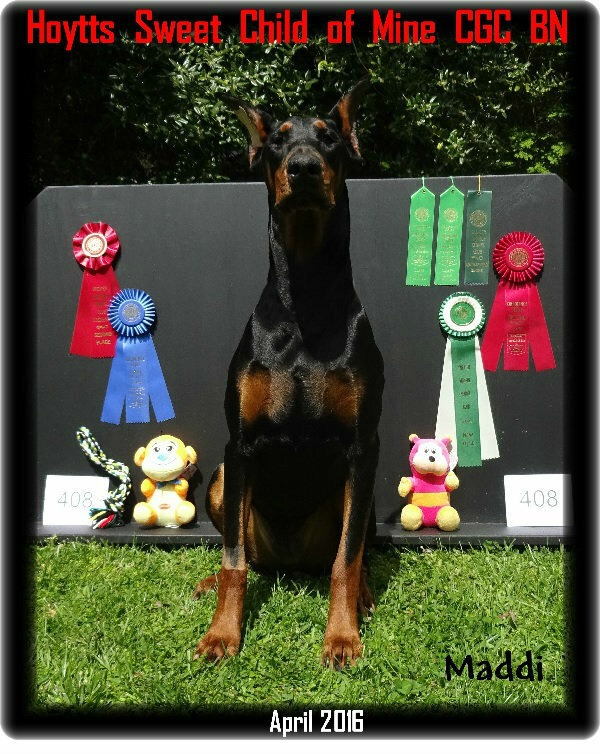 For her to get those scores was just proof of how great of dog she is, and how great the Hoytt Dobes are in the Obedience ring. On top of that, she also won the High Scoring Working Breed award and received a very nice pet-mat for the award! So, all though I've said it many, many, MANY times...THANKS BARRIE for my most special girl and teammate! FLASH ...Phoebe just received her UD degree more on this to follow but here's what we said on July 4th 2011. 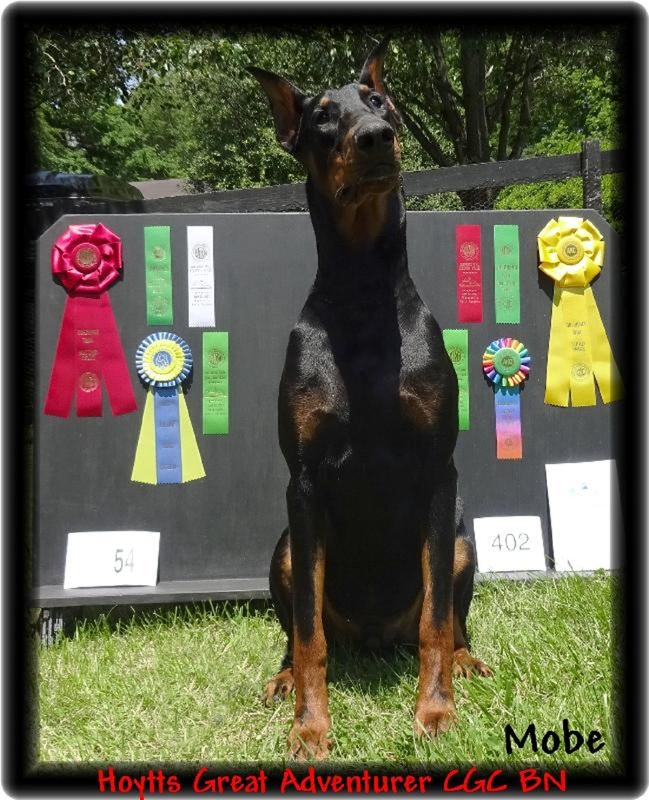 We learned that six privately owned Hoytt Dobes made the Top 10 ( in Dobes ) of the premiere performance magazine Front & Finish. This publication tracks all the breeds that take part in sanctioned trials in the United States. I'm trying to figure where we can list each of these guys but always their greatest success comes from being great companions - just some have a few more free week ends to show off. And this privately owned 'baby' of ours, this time Hoytts Hidden Treasure UD GN RE made the DPCA Top20 for 2011. Also check Owners Gallery to meet Phoebe and of course her owners are active on our Forum. To see Hoytt Dobes who first and foremost are best friends and guardians of their families step out in a complex are of life where both dog and man have to be one - a team working together not because there is hope to sell books on training or to encourage others to seek some service but step forward to show the world that when expectations are high to begin with, that both owner and canine were well matched for each other, that little will stop the quest. 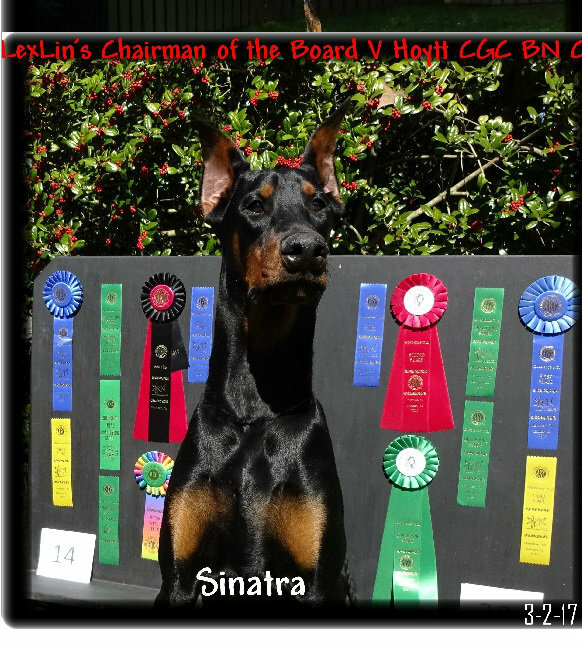 It is hard to imagine with shows every week across the country that when all is said and done this team made the most prestigious list the Doberman Pinscher Club of America puts together in obedience honoring the Dobes who consistently qualified under a scoring system that justly awards a win to all dogs who achieve a score of 170 or higher out of a 200 point total but that a few like the Hoytt team presented here made the Top 20 with scores of 195 and higher . In turn accumulated enough wins to stay ahead of the thousands of Dobes also showing. 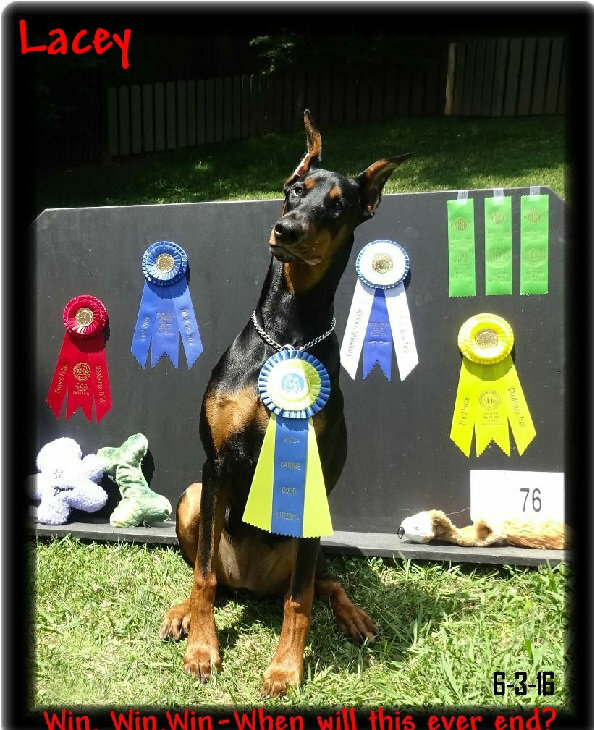 So while I congratulate this team, I offer my compliments to the other 19 who made the list and all other Dobe owners who know education for man and dog so enhances 'the good life' that they just could not allow their canine kid to be one more dog in a world with tens of millions of educational drop-outs.